This package gives you the flexibility to customize your machine the way you want, with the comfort of the Tri-Mode Dynamic Power Steering (DPS). 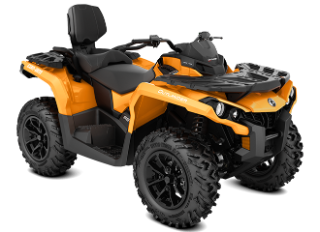 Equipped with the 62-hp Rotax 650 liquid-cooled V-Twin engine, with four valves per cylinder and single overhead camshaft, this Can-Am engine offers unmatched power for a true performance edge. The only independent rear suspension that eliminates scrub and camber changes, meaning the wheels pivot up and down rather than in a butterfly motion. This ensures the vehicle only moves in the direction you point it. Reconfigured for improved traction and optimal transfer of power to the ground. 94 x 46 x 53 in.